In soccer, I’m increasingly refereeing with lines from diverse sports on the field as turf fields are often used for football and lacrosse. And these lines can be a help to the ref. The football markings are also very good in spotting players in offside positions, particularly if the referee is doing the game solo as the ref can use these lines as a guide for positioning across the field. Regarding futsal, although I’m refereeing more futsal games on fields used only for futsal, traditionally youth futsal has been played in gyms and roller hockey rinks with the lines of many other sports. And these lines can be invaluable in stopping encroachment on restarts. Now, that line might be 4.75 meters or 5.25 meters from the touchline but that would work too as it’s very helpful for the players to have a line to go behind. It’s vitally important to go over the lines with your partner before the game so he or she indicates the same line for distance on the other touchline. For free kicks, find a line approximately five meters from the ball and tell the opponents to stay behind that line. But all these lines can also be confusing and this brings me to a dilemma for the referee regarding DOGSO (Denial of an Obvious Goal Scoring Opportunity). One definition for the sending-off offense of DOGSO is denying the opposing team an obvious goal-scoring opportunity by deliberately handling the ball. 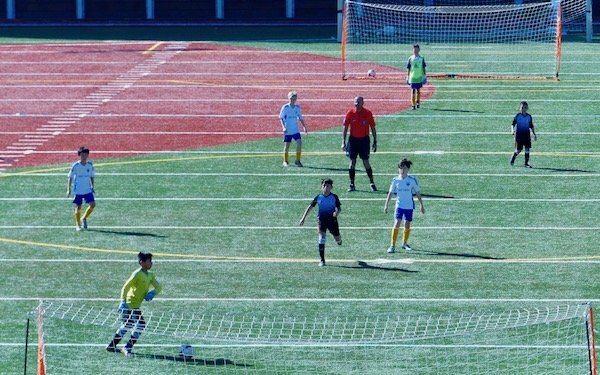 The dilemma is when the goalkeeper handles the ball a yard or so outside the penalty area, marked by a yellow or red soccer line, but just inside the white football line. Yes, I could send off the keeper for DOGSO. And some people might scream for a red card no matter how many lines are on the field and no matter the age group. Instead, what I have done several times is award the direct kick and show the keeper a caution for unsporting behavior, giving the keeper the benefit of the doubt that the goalie did not know exactly which line to follow. I feel good about doing this and very briefly explained my reasoning. Additionally, I would like to point out in my games that the number of times the keeper deliberately handled the ball on fields with multiple lines was far greater than on fields with just soccer lines, giving validity to my view that the keeper was probably confused by so many lines. 4 comments about "Use lines to help you ref". Barry Tuck, January 24, 2019 at 5:32 p.m.
Yea, Randy, spot on! One word of caution, while turf field can be even more confusing with the multiple lines (perfect example, we have one field in our area marked for Football, Soccer, Lacrosse, and Ultimate, plus it is super crowned in old Football style to the point where you can't see half of a player on the other side of the field!). worse are natural fields marked for more than one sport where the lines are not square. Or, mistake I have made, assuming the "line" showing due to a sprinkler system or some other feature, was square. As to the multiple lines around a goalie box, I tend to give the visiting goalie a little more leeway than the home team, as it is the home teams responsibility for the field and assumption is they would know it better. Same on natural fields, often they are poorly marked, or recent grass cutting removed most of the line . . . visitor gets the advantage on a judgement/intent call. I'll warn them, of course, and ideally proactively . . we're playing the blue lines, teams, keeper, make sure you release the ball before you clear this line, etc. . . but even so, in the heat of the game, I might make allowance for the visitors slight overstep and give them a quiet warning. As a coach, I remember a game with an obviously inexperienced ref crew where the AR called my goalie 6 times in a row for carrying the ball over the penalty area line while punting. Ref remanded me to my "technical" area so that I couldn't see what my U-12 player was actually doing wrong. Shame on my guy (who was otherwise an excellent keeper) for not recognizing by the second call that he simply needed to release earlier. But what I suspect was, he was releasing plenty early enough before crossing the line, but his motion and kick took him over the line. It was never called before and after that game. And the field was not well marked. Al Micucci, January 25, 2019 at 8:10 a.m. Very nice article Randy. A topic that many of your colleagues are dealing with. frank schoon, January 25, 2019 at 9:33 a.m.
Craig Cummings, January 28, 2019 at 9:04 p.m.
Good point randy about the keeper and so many lines, I get it mixed up some times in fast games. These many lines can be hard on us Refs too.